Rocking the helpful web since 2007. It ensures that the solutions to the most common problems are written in a clear, concise, and straightforward language that is easy for our users to understand. It reduces the pressure of our community of volunteers since most users are self-served. It gives us a powerful way of tracking which problems are the most common with the help of metrics. 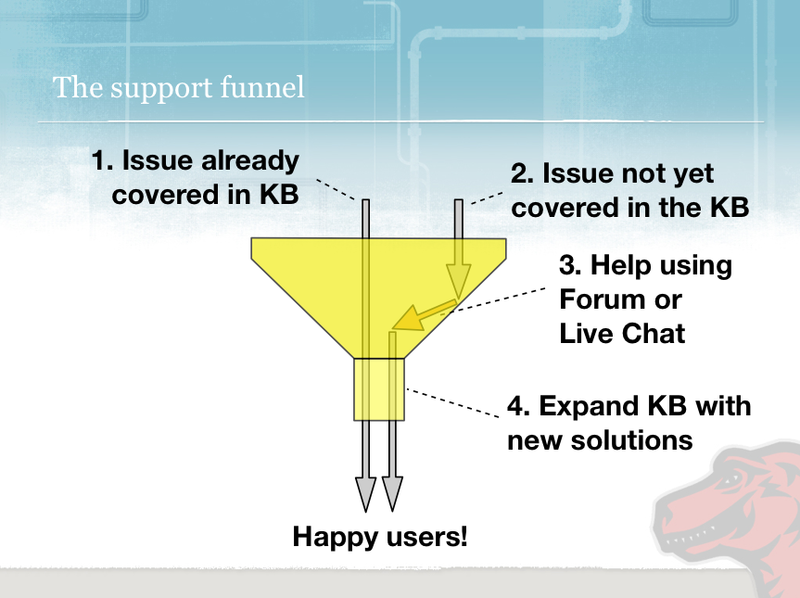 The Support Funnel. For more information, see The vision for SUMO – Part 2: Understanding the bigger picture. So, how do we ensure that people find the solution to their problem in the Knowledge Base? Well, one way of finding the solution is by searching for it — something we try to make very obvious on the start page. The reason why we think searching is the best way of finding the solution is because the Knowledge Base is big. Really big. While we have a list of the most popular support articles right there on the start page, it’s hard to make it obvious that there is a lot more content in the Knowledge Base than what is shown on the start page. 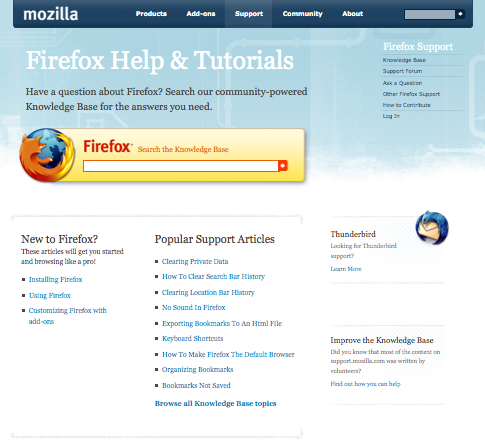 The start page of Firefox Support, clearly emphasizing on the search function. So, is everyone really comfortable searching? Actually, the almighty and ever so wise chofmann and I have started to see evidence that some people prefer to browse for the solution rather than searching for it. Among the people that visits the Firefox Support start page and doesn’t instantly leaves the page, only roughly half of them actually searches. The other half either clicks on one of the hand-picked popular support articles, or clicks on some other link on the page. We’re not sure what the reason for that is, or if there are several reasons. It could be that people are unable to accurately describe the problem they’re seeing — considering how many people that are using Firefox today, this is not surprising. Even my older brother, who has been using computers for at least ten years, has problems describing some of the problems he has with his computer, and usually I have to pay him a visit, have a nice cup of coffee, and fix the problem myself. Another reason could be that people simply prefer to browse a categorized list of articles instead of searching — essentially just clicking on a few links instead of actually typing. I talked to our creative genius John Slater a few weeks ago and he said that he’s usually a little skeptic about internal search engines and that he prefers to just browse. Francisco Picolinni from the Mozilla Hispano community provided a third possible reason why people are unwilling to search — because they might not think anyone else has the same problem. Regardless of why not everyone searches, it seems like we should work on providing a good way of browsing the Knowledge Base. We currently have a link at the bottom of the list of popular support articles saying “Browse all Knowledge Base topics.” However, the page that link takes you to is just a long list of all articles ordered by hit count — not exactly easy to navigate. chofmann, John Slater and I recently brainstormed around how we could ensure that as many people as possible find the solution to their problem in the Knowledge Base with minimum effort. Since the Knowledge Base articles are loosely connected with tags like “bookmarks,” “location bar,” etc., one interesting possibility would be to show these tags in a tag cloud that would provide a better sense of the diversity of the content while still pointing to specific, popular topics. Clicking on a tag would filter the list to only show the articles with that particular tag. A tag cloud around the topic Web 2.0. Another problem to solve is making sure that people really understand that they can browse for solutions as an alternative to searching. We want people to understand that Firefox Support has the answer to their problems and that they should stay on the site until the problem is solved. This probably means we have to take a closer look at how the start page is designed to see how we can better communicate this. If you have ideas on how we can achieve this, we are interested in hearing them! I’m also sometimes wary of built-in search engines (so many are so terrible), although the impact for me is that if my first search gives obviously braindead results, then I’m unlikely to try again. If the results are unhelpful, but do seem relevant to my query, then I’m likely to try again with a different query. I’ve also found that lists of frequently-encountered-problems are appealing first-click targets, playing the odds that my problem is likely to be something other people are running into. It might be interesting to filter your data by click stream… Are the people who don’t search seeing their problem under “Popular Support Articles”? If so, they’re probably not reading much further. i tried the search route. i am not a techie and i just used “whatsnew” to narrow the search. my problem is that when i upgraded to 3.0.5, whenever i open firefox, “http://en-us.www.mozilla.com/en-US/firefox/3.0.5/whatsnew/” always opens which is very irritating. last time i upgraded this notice only happened once. can you help me guys? it’s so hard to look for the solution here. Many older people or newbies on the computer just do not like to type because they aren’t so fast. This is certainly a problem as well. The best practise in my eyes would be a diagnostic tool, that preselect possible failures and then leads you to solve the problem. Welcome to the official blog of community-powered support project helping users of Firefox and other Mozilla-branded products. Meet the people behind Mozilla's Support experience.